This is the 3rd and currently last in the Theodore Boone Series. This book does promote the idea that sometimes you should stand up and fight (without weapons). Theodore is involved in a school fight. He also steals a computer password from his parents’ law firm to help clear his name of a crime. Theo Boone might only be thirteen, but he's already uncovered key evidence in a groundbreaking murder trial and discovered the truth behind his best friend's abduction. Now with the latest unfolding of events in Strattenburg, Theo will face his biggest challenge yet. 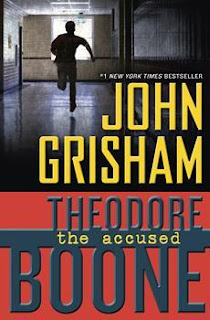 Filled with the intrigue and page-turning suspense that made John Grisham a #1 international bestseller and the undisputed master of the legal thriller, Theodore Boone's adventures will keep readers enthralled until the very last page.